Sedna is a reasonably large trans-Neptunian object with such an elongated elliptical orbit as to make it one the Solar System's most remote bodies ever discovered. Indeed, the furthest extreme of its orbit is so far out, some astronomers have gone so far as to call it an Inner Oort Cloud object. It is only about 620 miles in diameter and was discovered in 2003. With a distinct reddish hue, it rotates once on its axis in 10 hours. Here we have an artist's impression of Sedna at the most remote point of its orbit. At this distance, the Sun appears merely as an extra-bright star. The distinct redness of its surface has led scientists to believe that it is coated in tholins. This in turn leads to the probability of the presence of methane, which has since been confirmed by observation. Other compounds making up Sedna's surface are thought to be methanol, nitrogen and carbon. 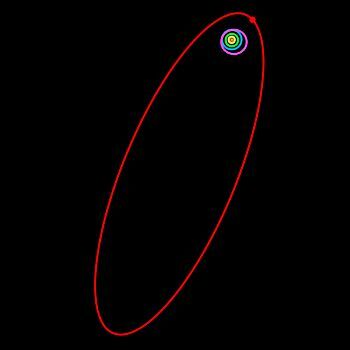 Sedna's orbit is so elongated that it takes it about 11,400 years to work its way around the Sun. At its closest approach, it is still 7,064,641,352 miles away from our star. The furthest distance it reaches, at the other extreme of its orbit, is an impressive 87,099,591,409 miles. Scientists have speculated that this remoteness may actually take it into the Inner Oort Cloud. This graphic displays this elongated orbit quite dramatically. At the time of its discovery, it was 8,330 million miles away, en route to its closest approach, which it will reach in the year 2076. 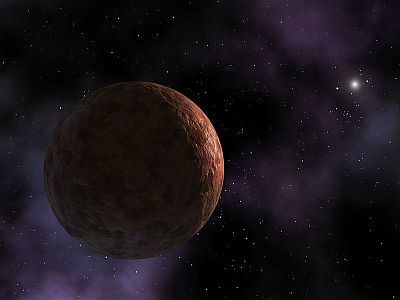 Because Sedna is spherical in shape, scientists have surmised that, at the time of its formation, it must have had a more normal orbit, because one like its present one would involve forces preventing the coalescing of smaller bodies to form it. Therefore, there is then the problem of what caused the object's orbit to change so dramatically. Three hypotheses have been suggested. The disruption could have been caused by a large, undiscovered planet beyond the Kuiper Belt; or simply a passing star; or action exerted by the other young stars in the Sun's birth group at the time of the Solar System's formation. Computer simulations favour the last one. On this page, Sedna has been referred to variously as a trans-Neptunian object and an Inner Oort Cloud object. Because its orbit is so extreme, scientists are in contention regarding its classification. The Minor Planet Centre, which is the official body for cataloguing heavenly bodies, states that it is a "scattered object". This has been challenged by many astronomers, who suggest that an entirely new category should be created for Sedna. It should be termed an "extended scattered disc object", as the definition of a scattered disc object is one that is not affected by the gravitational pull of the planets and is essentially "detached" from the Solar System. Sedna certainly fulfills that rule. The "inner Oort Cloud object" idea is stretching things slightly. The object's most remote position still leaves it considerably far short of the boundary of the Oort Cloud. Sedna also meets the criteria required to be a dwarf planet and many astronomers are referring to it as such.